Please be patient, this page is graphic intense. 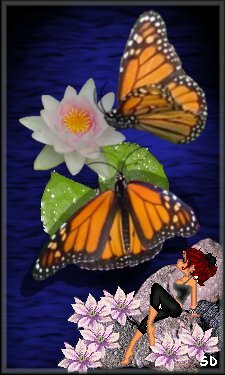 Sandra Dee's World of Butterflies is made up of all the Butterfly pages I have put together. Visit the Butterfly Shop - And help support Sandra Dee's World of Butterflies! You will find a link for each: A butterfly graphic gift for you, free butterfly graphics, butterfly photos from my backyard garden, a page on how to do your very own backyard butterfly garden, butterfly E~Cards, butterfly graphic slideshow, Free to use butterfly PSP Tubes, and a butterfly links page. 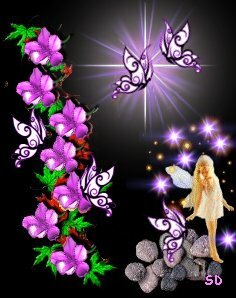 Just follow the pink butterfly. but if you don't hold it close enough it can fly away." Pictures taken from my backyard Butterfly Garden. All the graphics on these pages are from Free Graphics I collected from the web. 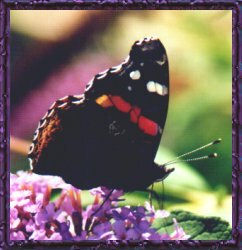 All Greeting Cards are from photo's taken in my Butterfly Garden. View a large collection of links on Butterflies. If you don't know what a PSP Tube is, it's a way to make pictures easily manageable when make graphics using the Paint Shop Pro Program. 90% of my graphics are made with PSP Tubes. I have a page of free live butterfly tubes for you to use. There is no link required back to my site when using my tubes. The graphic above with the butterfly on the lillypad was made from these tubes. 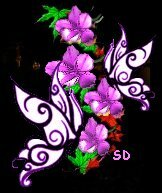 I hope you enjoy the butterfly sites above. If you are a true butterfly lover as I am, wouldn't it be great to be able to sit in your house and watch lots of butterflies flying around in your very own butterfly garden? I have a butterfly hummingbird garden with a fish pond in the center, there is nothing more relaxing than to sit at the kitchen table and watch all the wildlife it attracts. This site is family-safe and contributes to the appreciation of nature on the Internet. Awarded by TheButterflySite.com. Just want to say thank you Sue for the award. Are you a butterfly lover?